Welcome to the inaugural edition of CEJ. 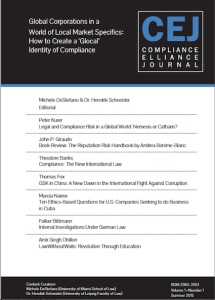 We are proud to present a variety of articles that address the role globality plays in today’s compliance world. Our goal is to create an atmosphere encouraging cross-cultural dialogue among business and legal practitioners, academics, and students. Below you will find all articles available for download as PDF. Legal and Compliance Risk in Global World: Nemesis or Catharsis? Click here to view in a separate window or to download the transcript.